Who Cares About Animal Care? 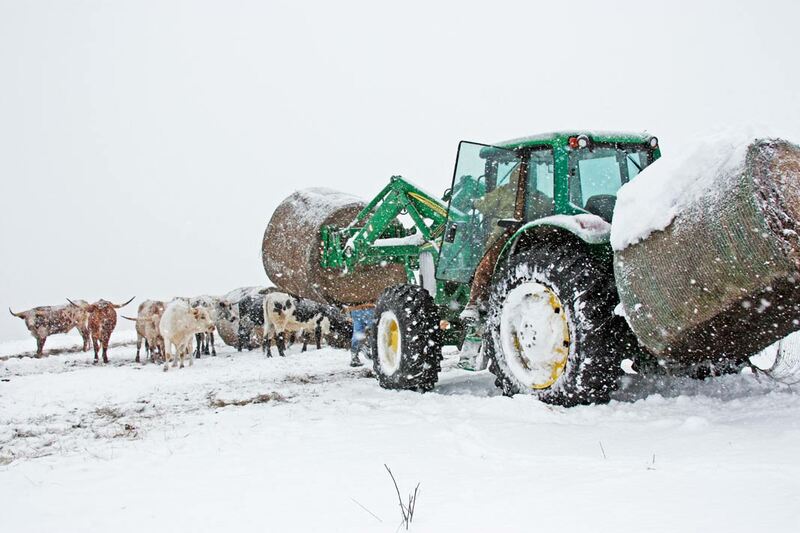 Normal Ohio livestock owners bale hay, stack it near feed areas and plan to maintain cattle in a healthy condition prior to a major storm. Cattle hides are 10 times thicker than human skin. That is the way the Lord made cattle. Concern about animal care has raced from Europe to the US with increased legislation, ballot issues and the "appearance" of growing compassion for farm animal welfare. The leading "compassionists" politically include PETA and HSUS. Millions of dollars are being raised to tighten the screws on caregivers and the USDA is ready to help with monitoring and enforcements. Most political acts have some valid basis of need, and so do animal care concerns. Ohioans who voted for Issue #2 (Animal Care Enforcement Board) can easily recall the cattle altering, the greedy disregard of animals and national embarrassment at the Ohio State Fair in 1995. Quickly an Ohio Dept. Of Agriculture investigation led to convictions of 10 steer exhibitors who drugged, tampered with and injected show animals with paraffin, silicone or oil injections to cosmetically enhance championship appearances. Drugs were acquired from numerous USDA licensed veterinarians who were also indicted in the scheme. One Ohio exhibitor was forced to forfeit sale proceeds of $37,500.00. During the worst blizzard every critter is fed clean nutritious fiber. No cow is left behind. Cattle owners plan and provide for their own stock. No government board is required to inspect and demand that cattle be cared for. Going back in history to 1494, Christopher Columbus transported 17 boat loads of pulling oxen from Spain to North America. The size of the stalls per animal on each boat would make a can of sardines appear spacious. Yet, nutrition and care were of the utmost importance for these first valuable beast of burden. Columbus knew the seriousness of health for pulling strength, longevity and stamina. Modern animal rights activists would have a coronary doing a spot inspection on the Nina, the Pinta or the Santa Maria. Less than 3% of the nation are livestock producers -- food producers. Any time the other 97% decide to leave their air conditioned or heated comforts and check out the farm, their main concern is where they step in the corral. Soon the Ohio Animal Care Board (committee of 13) will be empowered to enforce their animal care rules. Although none of the 13 may own or have experience with cattle, they will judge farm care of cattle and enforce. PETA and HSUS have their own opinions and want the authority granted to them by government to also regulate judge and police all animal care. 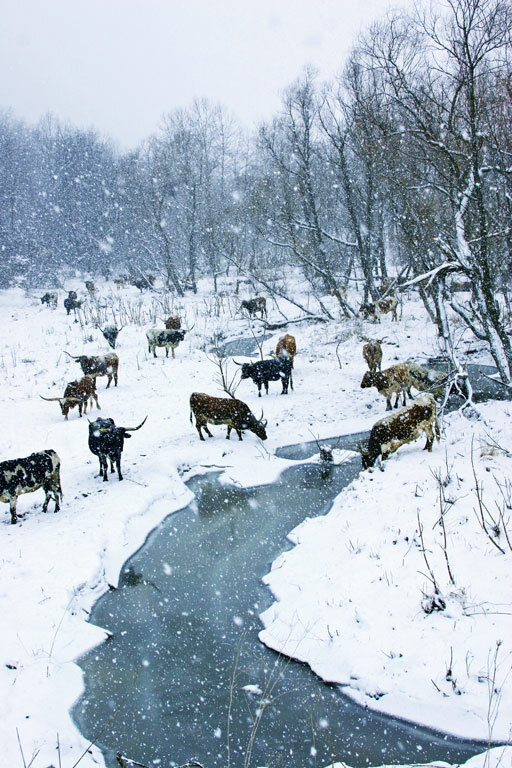 Before the blizzards herds are placed in brushy valleys, protected from the wind, with continuous warm spring water. A cow will drink one gallon of water per 100 lbs of body weight per day. A herd of 600 cows will need 6600 gallons every day. During February, 76" of snow dumped on eastern Ohio. 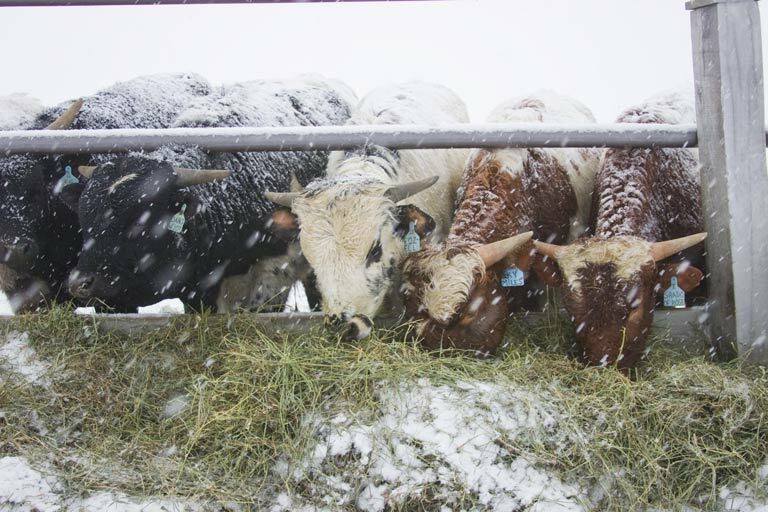 With just over 1000 cattle to care for, daily every critter was nutritiously fed, regardless of the wind, cold and snow. Not a single animal was lost. There is an interesting thing about ownership, no one wants stock to live more than the owner. No one left a warm government office to check and see if the cattle were fed. It was not necessary. Critter owners don't want to lose herd value. Every animal owner wants the herd to reproduce, be healthy and have top market value. It is amazing that anyone would think they care more about Ohio farm animals than the owner. In fact farmers are insulted, totally insulted that, after ranching for generations, someone who has never raised a cow may have the job of checking herds to see if they are cared for. Does the HSUS have a valid purpose? What happened before HSUS? What happens now? Today, if an animal cruelty issue is observed, the witness notifies the Sheriff. The Sheriff engages a veterinarian to do an investigation. The professional health expert recommends action. Animals may be confiscated, dispatched, or not considered an issue. The animal owner, if believed to be willfully cruel, may be charged by the county Prosecuting Attorney and laws involving animal cruelty are strictly enforced. A normal cattle owner can identify every cow in the herd by their name or number and recall their pedigree several generations. No new computer or government regulations are needed for herd inventory and complete ID. That is just normal stuff. 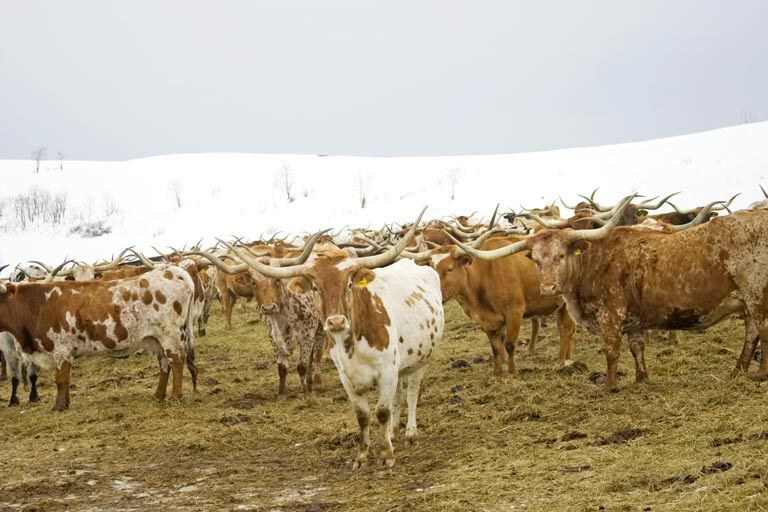 No one knows cattle and herd management like the herd owner, and that is the way it is. The most famous case on the national scene involved fighting dogs. Michael Vick pleaded guilty to interstate federal felony charges. He served 21 months prison time destroying a multimillion dollar football career, and forcing Vick to file for bankruptcy. Are more teeth needed in animal cruelty laws? Now, fragment a scenario. What if the HSUS was at work in 1494? At first light there is a row boat in the Gulf of Mexico headed toward 17 arriving ships. Is animal care important to them? Would they demand to change the stall sizes or the nutrition? Perhaps give the oxen more leg room, or just --- yes, you guessed it. Now we all understand --- they are just interested in fund raising!